All-inclusive resorts are amazing—you can explore, eat, and drink to your little heart’s content. Relax. It’s already paid for! However, when you have a restricted diet, the thought of ‘all-inclusive dining’ is the opposite of relaxing. When my husband Tyler and I were planning our wedding in 2012 I tried to research resorts, cruises, etc., but the information I found on gluten-free dining experiences was varied at best. 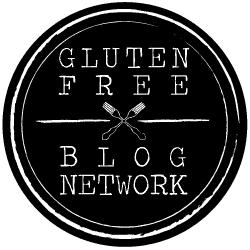 I was new to the ‘gluten-free thing’ and researching the topic filled me with anxiety. We didn’t risk it. Four years into our marriage, my parents invited us and the kids to Camp of the Woods, a retreat center in the Adirondacks. Meals would be shared in the dining hall. *cue the anxiety. * Despite my fears, the week was amazing. We went back again this summer. You guys, the people are right, all-inclusive resorts ARE amazing! 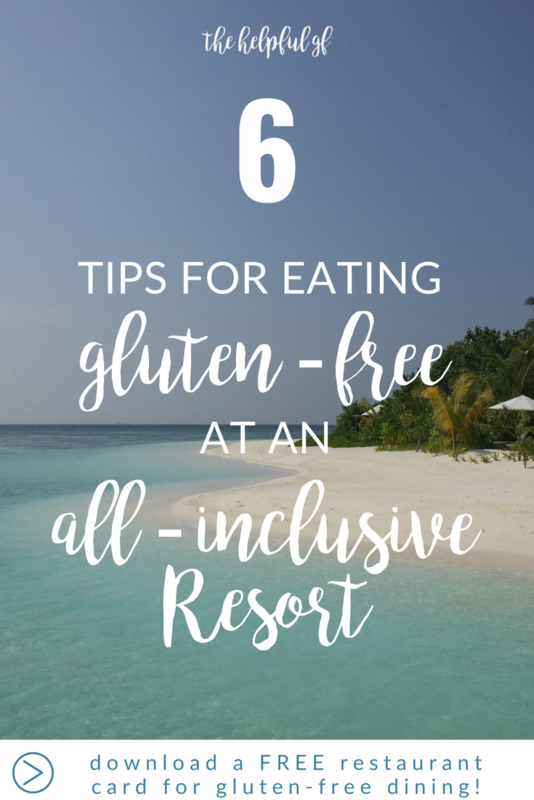 Six years later, I’m here to share with you my top 6 tips for eating gluten-free at all-inclusive resorts. In 2012 when we wanted to book our honeymoon, finding an extensive menu with options that are gluten-free at all-inclusive resorts was difficult (at best). But today, many of the top resorts have prioritized allergy-friendly and gluten-free meals at all of their restaurants. Looking for a tropical resort such as Beaches or Sandals? Gluten-free options abound. Wanting a family friendly trip like Disney? It’s gluten-free heaven. When researching what’s gluten-free at all-inclusive resorts, I start with a list of 2-3 specific resorts and dig in. I recommend beginning at the resort’s official website and finding their dining page. Search for their restaurant menus, a note on food allergies, and if you don’t see anything, look for a search bar. The best search terms to use are “gluten-free” or “food allergy.” Many websites also have a help box or customer service who can be very helpful. 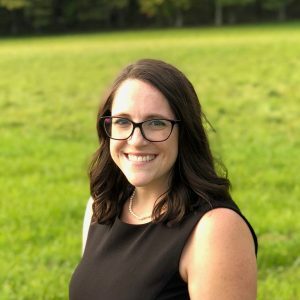 For example, I went to Sandals’ website, I quickly found that they not only do accommodate Celiacs and food allergies, but they even have Culinary Concierges to assist you with finding allergy-friendly options! Chefs at each restaurant will accommodate gluten-free needs and can prepare almost any dish gluten-free. Score! Once you think you have a top contender (or two) I recommend searching social media and Pinterest to read about others’ experiences at the same resort. 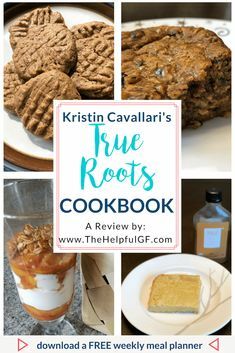 You can even check out my “Gluten-Free Traveling” board where I’ve rounded up many reviews in one place! Note: be mindful of the publishing dates of blog posts—resorts may have put new standards into practice since a negative post or review was written. That said, if you read something in a review that concerns you, it never hurts to call the resort back and ask some more questions! If you struggle finding information on gluten-free dining on the website and customer service is not helpful, I recommend moving on to a different resort. If the resort isn’t helpful before booking your vacation, then they likely won’t be helpful once you arrive and they already have your money. Even if you conducted thorough research before booking your stay, call the resort about one month before your stay to ensure that you’ve done everything necessary to have a safe gluten-free experience. Before our stay in the Adirondacks, the resort wanted us to fill out a form online with our reservation number, number of people in our party, and detail any dietary restrictions. Other resorts have similar requests of their guests requiring dietary restrictions. In addition, it’s a good idea to ask for a contact to meet with when you arrive. At Camp of the Woods we talked to the hostess at the dining hall. Food was served buffet style, so she showed us which lines to find the gluten-free options. Furthermore, we learned that they kept gluten-free bread, rolls, and desserts behind the buffet line for their gluten-free guests and that their waitstaff would get it for us. More about eating at buffets in tip #4 for eating gluten-free at all-inclusive resorts. If traveling internationally, ensure you have something similar translated into the native language. Also, if something doesn’t seem right (i.e. your tacos seem to be on flour tortillas) always double check that you received a gluten-free meal. The slight inconvenience of double checking is much better than being sick for the rest of our vacation. 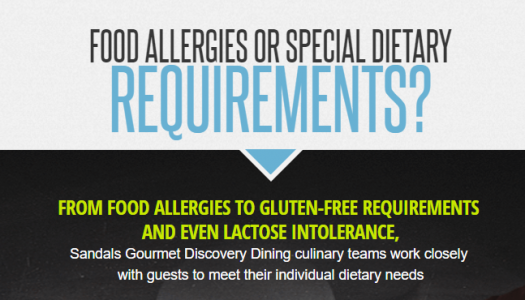 Click here for more tips on eating out gluten-free at restaurants! Since buffet lines are high risk for cross contamination, speak to the buffet attendants. Ask what’s safe! 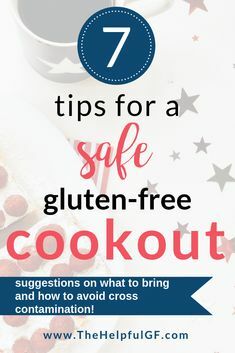 Many buffets will label their items as “gluten-free,” but it may be worth a follow up to ensure against common preparation concerns (such as, “Were these French-fries fried in the same fryer as gluten-containing food?”). If they aren’t sure, ask that they please confirm with the chef. Also, if cross-contamination seems to be a concern on the buffet line, speak up! Ask the server if you can have the item fresh from the kitchen! For example, when it was pasta night at Camp of the Woods, although they kept gluten-free noodles behind the buffet, there was fear that the sauce (labeled gluten-free) might be contaminated with gluten due to the ladle touching regular pasta. The buffet attendant happily retrieved a cup of sauce from the kitchen and brought it to us. It’s always safer to ask! I always get stressed out packing for vacation and fear that I didn’t bring the right things. When you’re gluten-free, always remember the following items: gluten-free snacks, essential vitamins/medicines, and gluten-free personal care items. Although the resort may be very accommodating at their dining facilities, you may have a harder time finding gluten-free snacks outside of meal times (especially if traveling internationally). Many of these resorts have room service, but at some, room service is an extra charge. Furthermore, if you are a diabetic (like Tyler), you might need a gluten-free snack at 2am. Therefore, I recommend you pack a couple trusty snacks to bring with you. I recommend some good bars like Kind or LaraBar. These are small and compact, but also filling. Want more great ideas of what to pack? Check out my post on the gluten-free snacks I bring on vacation here! In addition, if you rely on any specialty items, don’t forget to pack them! For me, these specialty items are stevia packets for my coffee and my Arbonne Fit Chews for sweet treats and Fizz Sticks to mix with my water. Any time we travel I also pack a couple basic medicines (like Immodium, Tylenol, or activated charcoal) just in case. BONUS: Don’t forget your travel-sized bottles! These are just TOO adorable. Note: While each of these are available on Amazon, many of them are cheaper at Thrive Market. You can read more about my experience with Thrive Market here. Also, Brandless carries gluten-free body lotion, shampoo, conditioner, body wash, toothpaste, mouthwash and MORE for only $3 each—which is an amazing price for gluten-free personal care. Click this link to check out Brandless and save $6 off your next purchase (which means you get 2 items for FREE). If you’re going to be hitting the bar on your trip, be familiar with what brands of alcohol are or aren’t gluten-free. Know the specific brands and drinks that are safe. Ask questions and order appropriately. Tip: If your resort does give you a culinary concierge, make sure you discuss the gluten-free drinks available as well. Have you had experience eating gluten-free at all-inclusive resorts? If so, share your experience in the comments below. Are you planning a trip soon? 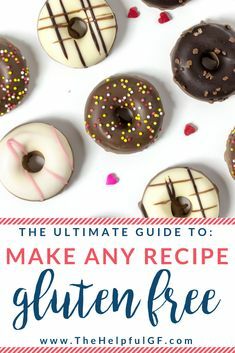 Pin this post and check out my “Gluten-Free Traveling” Pinterest board for gluten-free friendly destination suggestions. Also, download this restaurant card I created just for you to bring along on your vacation. Are you ready to do gluten-free living totally STRESS-FREE? 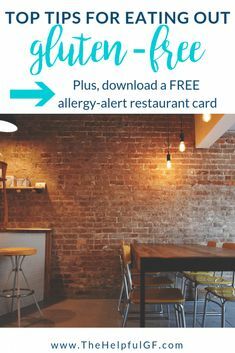 Get FREE instant access to my allergy-alert restaurant card PLUS the full online library of free printables designed to make your gluten-free lifestyle totally easy! These are great tips. Thanks to hotel booking websites it has now become very easy to make sure that they allow for my gluten intolerance when I get there. Most people have been very helpful but still have to keep my guard up for the sneaky ingredients that may contain gluten. Yes, there’s so much more information available online from hotels now! And I totally relate, guards have to ALWAYS be up!